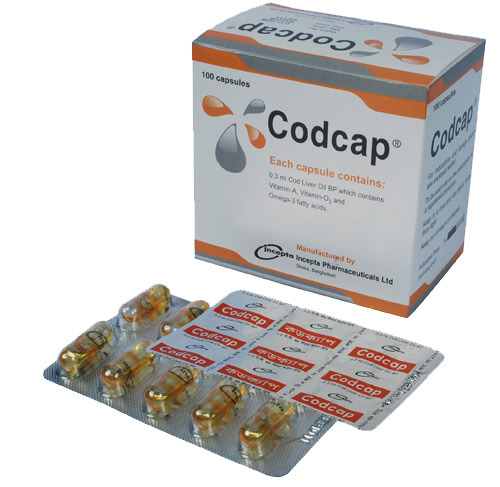 Codcap: Each capsule contains Cod Liver Oil 0.3 ml which contains Vitamin A, Vitamin D3 as well as Omega-3 fatty acids. Cod Liver Oil is a rich, natural source of Vitamins-A, D3 and Omega-3 fatty acids. Vitamin A helps to maintain healthy respiratory and digestive tract linings which are the first line of defence against infection. It also supports a healthy immune system. Vitamin-D is essential for the optimal uptake of Calcium from the intestine into the blood and helps maintain normal blood and bone levels of Calcium. EPA (eicosapentanoic acid) and DHA (decosahexanoic acid) are Omega- 3 fatty acids. It is thought that EPA and DHA may reduce the risk of coronary heart disease. • Reduces the risk of Coronary Heart Disease. Adults and children over 6 years- Take 1-2 capsule(s) 3 times a day with meals, or as professionally prescribed. Children under 6 years - Only as professionally prescribed. Pregnant and lactating women - Take 1 capsule 3 times a day with meals. Prolonged usage of large amounts can lead to hypervitaminosis symptoms of which include dry mouth, rough skin, painful joints swelling, fatigue, anorexia, loss of weight, vomiting and other gastrointestinal disturbances .These may disappear on discontinuation of supplementation. Caution should be exercised in those with chronic renal failure or during renal dialysis, the patients having hepatomegaly and raised ESR. Moderate dose of Vitamin-A (8,000-10,000 IU) is safe in pregnancy and lactation.